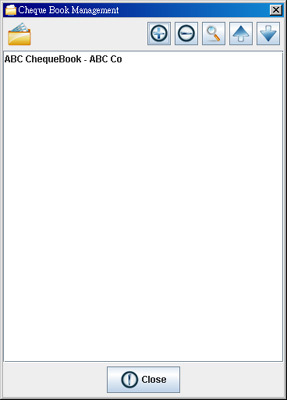 Cheque Book Management allows you to manage different cheque book easily. Add - Add a new cheque book. Remove - Delete the selected cheque book. Edit - Edit the selected cheque book. Up - Move cheque book upwards. Down - Move cheque book downwards. Cheque Book ID - An ID to identify the cheque book. It is used for record only. Account Name - The name of the account which the cheque book belongs to. It is important for account report generation. Account Number - The A/C Number of the account which the cheque book belongs to. It is important for account report generation. Currency Unit - Specify the currency label and subunit value. By default, they are Dollars, Cents and 1/100. Cheque Number - The cheque number sequence of the cheque book. 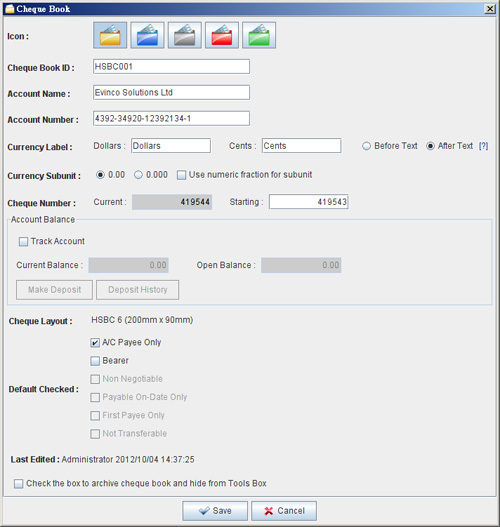 Balance Tracking - Assign an account balance if you want to perform balance tracking. Default Checked – Set the fields as selected when creating a new cheque. Cheque Layout - The layout that this cheque book used. This layout should fit your physical cheque book, otherwise the printout may not correctly layouted.